Is your conservatory closer to grey than its original pristine white? Is it difficult to reach and clean all areas of your conservatory and its roof? Is your PVC green and grubby and no longer looking immaculate? Are you selling your home and want to present it in the best possible condition? Most conservatories require a regular clean. How often this might be depends on the direction your conservatory is facing, where you live, and the local weather, which will affect the amount of moss, lichens, algae and bird droppings. Thompson conservatory cleaning leeds can advise you. 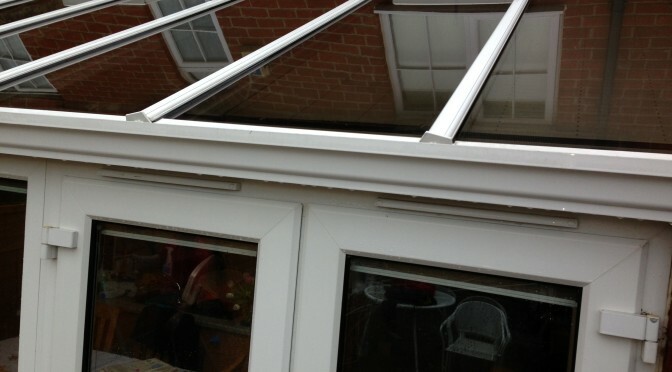 Here at Thompson conservatory cleaning leeds we restore your conservatory to its former glory. Due to the british weather being as it is conservatorys can get very tired looking fast. Green algae can form on the upvc and look generally untidy. Conservatory cleaning is a wise addition to our regular window cleaning service. We can keep your conservatory in good shape all year round as a 4 weekly or 8 weekly clean or we can do a one off full valet. please see our prices page for details of conservatory cleaning pricing. How do we clean conservatorys? We wash the entire conservatory from top to bottom by hand, including the hard-to-reach decorative crestings and finials on top of the roof. The beauty of the finished job lies in getting these little details right. If it has been a long time since your conservatory was cleaned or it is time for a spring clean you may wish to opt for both our External and Internal cleans. This option is especially popular with people whose property is on the market. We typically clean the interior with specially selected chemicals and glass cleaners to provide optimum results. Conservatory cleaning leeds really does enhance the appearance of your property.